A brief history of the modern firework. Professor Chris Bishop, presenter of the 2008 Royal Institution Christmas Lectures, gives a family lecture on the history of the modern firework. Through demonstrations of pyrotechnic chemistry hear how Chinese incendiaries made from honey led to the development of gunpowder; discover how the loud bangs of fireworks are routed in the origins of photography; and find out how an accident in a nineteenth-century kitchen sparked a new chemistry for firework making. Recorded at the University of Cambridge on the 4 November 2011. The Science of Fireworks. Learn about the science of fireworks with this awesome video. How do fireworks work? Where do the cool colors come from? Fireworks may seem magical, but the science behind them is easy to understand. Learn how fireworks and firecrackers work and watch a fireworks video. 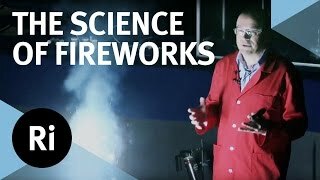 A pyrotechnics expert explains the chemistry that makes 4th of July fireworks displays possible. The Art and Science of Fireworks Displays Art, Chemistry, Physics and Math Light Up the Fourth of July! The science involved in a pyrotechnic display involves chemistry and physics. Inside the fireworks canister is a chemical mixture composed of atoms. Science of Summer: How Do Fireworks Work? In the spirit of Fourth of July celebrations, LiveScience reveals the science of fireworks and how the chemistry of the many shapes and colors of fireworks shows. Learn about the science of fireworks with this awesome video. How do fireworks work? ... What is flame spectrometry and how is it used by physicists and chemists?